What do I enjoy most about Hawaii? I like the beautiful sunny weather and warm waves. I like Hawaii’s beaches with their soft black, white and even green sand. I like Hawaii’s flowers, which include anthurium flowers, orchids and heliconias. And I also like Hawaii’s snack foods; here are some of my favorites. Chocolate covered macadamia nuts are decadent. Chocolate, how can you improve upon this divine treat? And Macadamia nuts, when they are roasted with a touch of salt, are amazing all by themselves. Put them together and you have the perfect mix of salty, sweet goodness. Manapuas have a funny name and you may not even know what they are. Contrary to various urban legends they are not made out of cat, but instead they are a dim sum treat brought here by Chinese immigrants when they came over to work on the sugar plantations. They are sweet white buns filled with char siu pork, kalua pig or even curry chicken. Hawaii used to be the pineapple capital of the world, but the pineapple industry is slowly fading away. 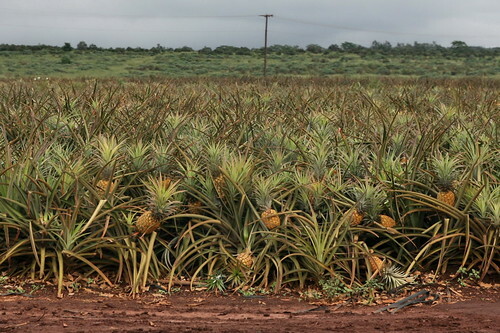 Nowadays it only produces about 2% of the world’s pineapple. However, pineapple is still an island favorite. In addition to the yellow varieties, now we even have a super sweet, white pineapple variety. Shave ice is the perfect treat for a hot day in the islands. It consists of finely shaved ice topped with a rainbow of fruit flavored syrups. You might think that shave ice is the same as a snow cone but you would be mistaken. Shave ice is made with special machines that use razor sharp blades to create extremely fine ice crystals that are much smaller than those found in snow cones. This gives shave ice a soft texture that is totally different than a crunchy snow cone.